All Cabin Kit Homes include... at no extra cost... pre-built "panelized" exterior and interior wall panels, pre-cut roofing, pre-built stairs (as per plans) and pre-numbered panel plans that save you thousands in labor costs and building time! 1. What is included in a Cabin Kit package? We offer complete pre-built “panelized” packages at no extra cost! Under the "NAFTA" free trade program, the package includes all pre-built exterior and interior wall panels, pre-built stairs (per plan), pre-cut roof system, pre-numbered panel plans, complete detail plans, plus floors, rafters, ridge beams, roofing, pre-stained siding, windows, exterior doors, interior passage doors, hardware, lock sets, exterior deadbolts, nails, bolts, screws, decks and deck railings... everything you need for a secure, weather-tight locked-up exterior shell package. 2. Do Cabin Kits meet building codes? Yes, Cabin Kits meet or exceed the new "IBC," "IRC" and "Urban Wildland Interface" codes (in high fire danger areas)... now being adopted by every city and county in the United States, and throughout Canada as well. (Note: Cabin Kit packages are engineered to meet local requirements for roof snow loads, wind loads, and seismic zones (in earthquake-prone areas). Special protective treatments are also available for tropical pests and/or insects. And our exclusive "FAST-TRAK" system includes detailed engineered plans that expedite the permit approval process. 3. Will our building department always issue building permits? 4. Do we pay state or local sales taxes? No. Under our exclusive "NAFTA" program (the North American Free Trade Agreement), the savings to US customers are extraordinary! 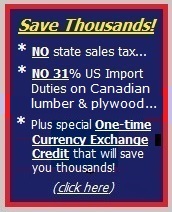 There are no US import duties or tariffs of 31%, no state sales taxes, plus a special one-time currency exchange credit that will save you thousands of dollars. And there are no US Import tariffs or border crossing fees, no brokers or sales agents, no middlemen, and no hidden mark-ups or commissions. 5. What kinds of windows and doors are used? Cabin Kits use double-glazed premium windows with energy efficient vinyl frames, plus thermal-efficient exterior doors with top quality locks and hardware. Special "Low E" energy-saving glass is also standard in all our windows, doors and patio sliding doors. 6. What kind of metal roofing is used? Cabin Kits use preformed residential steel roofing, pre-cut and made to order for each Cabin Kit package with a choice of many different colors. 7. Why is the cedar siding pre-stained? Pre-staining saves you countless hours of work and thousands in painting costs. Pre-staining (both sides, each board) also assures maximum protection against sunshine and weather. And extra touch-up stain is included with each Cabin Kit package. 8. Is log siding available? Yes, kiln-dried log siding is an option for the "log cabin" look... either pine or cedar... without the high cost and maintenance of full log walls. 9. Are decks and patios included in the price? Where decks are shown on the plans, the cedar decking (with railings, spindles and top caps) and all posts and deck framing materials and hardware are included in the Cabin Kit price. 10. Can we make changes to the Cabin Kit plans? Yes, any of the Cabin Kit plans can be changed, expanded, modified or "customized" to meet your needs and requirements or site conditions (such as adding a dormer, or a basement plan for a sloping lot). 11. Can we get foundation plans, or add a basement? Cabin Kit plans include your choice of foundation... including basements. Walk-out or "daylight" basement plans are also available for hillsides and sloping lots. Pier foundation plans can also be provided. 12. What does it cost to make design changes? Our design team has all of our Cabin Kit plans on computer, so the time needed to make design changes is usually quite modest. An estimate of design costs will be provided in advance. 13. What if we already found a plan we like? Our design team can quickly convert any plan into a complete Cabin Kit package. An estimate of design costs... and material costs... can be provided in advance. 14. Can we build the Cabin Kit ourselves? Building your own home is always a choice. Cabin Kit packages are pre-built and "panelized" for quick and easy installation. On smaller Cabin Kit models, your carpentry skills may be sufficient. For larger models, however, framing experience is highly recommended. For more information, contact us directly about our new labor-saving pre-built "panelized" packages that can cut building time in half, and save thousands in labor and building costs. 15. Can you help us find a builder? When you have purchased your Cabin Kit package and are ready to build, we may be able to help you find a qualified builder or contractor. 16. Do all the materials come in one shipment? Yes, and you also receive a complete itemized packing list. Your Cabin Kit plans also show which materials are used for each part of the home. The packing list helps both you and the contractor, and also keeps you in control so that unneeded extra materials aren't ordered by mistake. 17. What if something is missing? Before starting construction, check through the inventory and packing list of materials received. Mistakes can happen, and a quantity of extra materials is usually included. But if something appears to be missing, or cannot be located, just let us know. We will gladly replace the item, or reimburse you for the cost of purchasing the replacement item locally (be sure to keep copies of dated itemized sales tickets and paid receipts). 18. Can we buy the Cabin Kit plans separately? Yes, Cabin Kit plans can be purchased separately, and you receive full credit for the cost of the plans when you order your Cabin Kit package. The plans and blueprints will be essential in obtaining bids and proposals from local builders-contractors. As a convenience, VISA and MASTERCARD are available for the purchase of Cabin Kit plans and packages here on our web site. Orders for Cabin Kit plans are usually filled within 5 days. Please note: When Cabin Kit plans are purchased separately, they are protected by copyright and cannot be changed, engineered or used to obtain a building permit. 19. What is the delivery time for a Cabin Kit package? Delivery time is usually 90 days from the date of your deposit. 20. Does the Cabin Kit price include freight? Cabin Kit prices do not include freight/delivery. However, delivery costs are surprisingly low and are based on the location of your building site. More information on low cost delivery is shown on our website. (Note: In most cases, delivery costs are quite low. Learn how "NAFTA" saves you thousands of dollars in delivery costs when it's time to build, click here). Yes. Financing is available through most banks and lending institutions. "Owner-builder" programs are also available. And because Cabin Kits include all the materials you need for a complete "locked-up" weather-tight shell package, lenders are happy because you keep control of your building costs. We appreciate your interest and hope this information has been helpful. Your comments and questions are always welcome. To receive the kinds of information and materials that are most helpful to you, feel free to call us directly at: 1-888-358-1113.